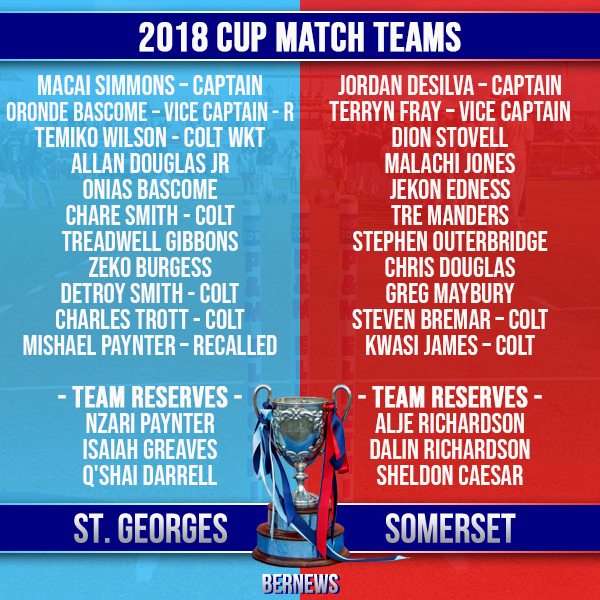 Selectors at the Somerset Cricket Club and St. George’s Cricket Club met tonight [July 28] to decide who will represent their respective clubs at the upcoming 116th Annual Cup Match Classic and both clubs have now announced their teams. Defending Cup Match champions Somerset Cricket Club made two changes to their team adding two colts. Cleveland County captain Steven Bremar was selected as was former Somerset Cricket Club league player Kwasi James. Terryn Fray will be the vice captain for Somerset. Challengers St. George’s Cricket Club have made several changes to their 2018 Cup Match team adding four colts and recalling two players. Temiko Wilson, Chare Smith, Detroy Smith and Charles Trott will all make their debuts while former captain Oronde Bascome has been recalled and will serve as vice captain. Mishael Paynter has also been recalled. Somerset all day and the cup stays in the WEST… Good team pick!!!!! Thanks St. George’s now go out there and bring the cup home!!! I see that nepotism has once again reared its ugly head in the selection process of the St. George’s team. Last year one St Geo player scored 20 runs in his first innings and 4 runs in the second. So given those last 2 Cup Match performances, how does he still secure a place on the team this year? Baring any interruptions due to rain, I’m predicting that Somerset will have very little problems securing a victory. Diehard Blue n Blue forever….but until we guys stop selecting FAMILY then we won’t ever get the cup back again smfh! All the best Oronde and Onias BASCOME proud of you. Bring the cup back St George’s Chinky. Congrats Bascome brothers, St George’s!!!!!!!! Congrats Zari. Bring that cup back to the east.